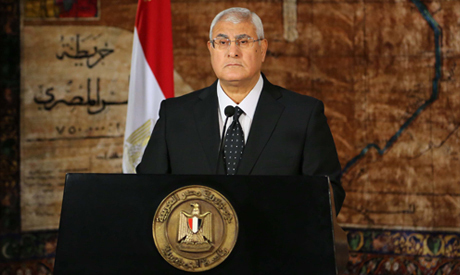 Interim President Adly Mansour declared "the end of the police state in Egypt" during his speech Thursday at the Police Academy commemorating Police Day which falls on the 25 of January. On 25 January 1952, Egyptian police in the city of Ismailia refused to evacuate and surrender the Ismailia governorate headquarters building to the British forces, during clashes between the Egyptian resistance and British forces. The Ismailia clashes resulted in the death of 50 Egyptian police officers, while 80 were injured. The 25 January became a national holiday in 2009, under the rule of president Hosni Mubarak. "The police [prior to the 25 January 2011 revolution] were made accountable for abuses committed by individual members and leaders [of the interior ministry], who should have been the ones held responsible," rather than the entire police apparatus, the interim president said in his speech. Mansour said the 25 January revolution has rendered a number of realities unmistakable to both the police and the Egyptian people: the essential role played by the police in society to maintain safety and security, as well as the restraint police must exercise in order to limit its role away from previously exercised abuses. Millions of Egyptians originally revolted on 25 January 2011 -- which coincides with Police Day -- against the abuses and violations committed by the Ministry of Interior's police force against them, ranging from widespread torture to widespread corruption. Currently, both ousted president Hosni Mubarak and his minister of interior Habib El-Adly face a retrial for their role in the killing of the protesters in the early days of the revolution. Egypt's police has been accused by revolutionaries of responsibility for the murder of over 680 protesters during the 18-day uprising that toppled Mubarak. However, court trials over the past three years have failed to convict most of the officers accused. "The [25 January] revolution mended the rift between the people and the police which was fuelled by the abuse of power and transgressions committed by some police commanders and individuals," Mansour said, adding that the police officers who continued to do their jobs conscientiously in the security vacuum that followed the revolution should not be forgotten. "The 30 June revolution turned a new page in the relationship between the people and the police, while at the same time putting an end to the police state and protecting the dignity of the citizen," Mansour stressed in his speech delivered before public figures, ministers and police forces attending the celebration. He asserted that the police are now aware that their role is defined by laws which they must respect. Similarly, rights afforded to the police enabling them to perform their duty in protecting the security of the country and the people should also be respected, Mansour added. Egyptian police were on unofficial strike between 28 January 2011 and 30 June 2013 against what the officers considered a media bias against them resulting from the violations committed by El-Adly and Mubarak's regime. "The police face a mission in securing the upcoming presidential and parliamentary elections," the interim president said. Despite expectations substantiated by news reports on Wednesday claiming Mansour would announce presidential elections were to precede the parliamentary vote, his speech did not clarify which would be held first. The interim president vowed to complete the battle against terrorists who threaten the security of the nation and ordinary citizens until victory, just like in the 1990s. Mansour saluted the police forces in Sinai, Kardasa, and every other part in Egypt, for their "heroism." Dozens of police officers were killed in Sinai clashes with militants since the ouster of Mohamed Morsi in July 2013. In August 2013, a dozen police officers in Kardasa, Giza, were brutally butchered by militants following the forced dispersal of two pro-Morsi protest camps demanding the deposed president's reinstatement. The celebration was attended by Defense Minister Abdel-Fattah El-Sisi and top political and religious leaders. Not one word about the egyptian citizens who lost their life in august? I don't think he should lose any sleep because a group of 7th century terrorists decided to take on the gallant armed forces and got thourughly whacked in the process.